Later today, the good people of Central, Louisiana (a town in exurban Baton Rouge not to be confused with the real Central Louisiana) will vote on their next State Representative. And it is very possible that Republican Barry Ivey will be elected. It’s adorable, right? 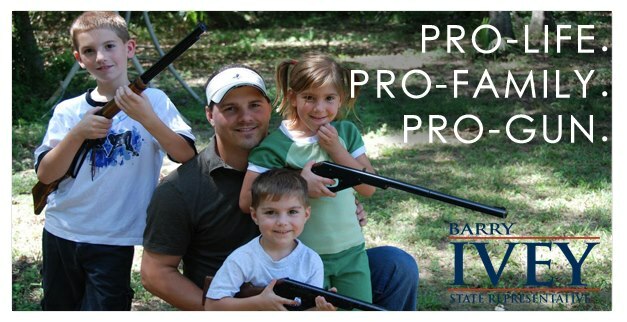 Barry, armed only with his visor, kneeling down with three of his four children and teaching them, as only a father could, how to use a gun as a political prop. (Incidentally, this pro-family, pro-life advertisement very obviously fails to include at least one of Barry’s kids and his wife, who I hope was morally outraged by notion that placing guns into the small hands of her small children in a political ad was just shameless, stupid exploitation, however cute it may seem). Ivey is President of Pinnacle Precision Services, LLC, which provides piping/mechanical services primarily to the nuclear power industry. Barry and Julie Ivey have been married for 14 years and have four children. “I will work closely with Governor Jindal, Speaker Kleckley, the business community and the conservatives in the Louisiana House of Representatives to bring continued reform to Louisiana and to fight for much needed funding for District 65. I have the temperament and experience to work with other legislators to deliver concrete results for our district. I am strongly pro-business, pro-economic development and pro-reform. I am a conservative and will continue to fight for the right to life and to protect our Second Amendment rights,” Ivey said. A couple of things: If your business is dependent on the nuclear power industry, then, whether you want to admit it or not, you are earning your livelihood from government contracts. Oh look, as a matter of fact, here’s Barry’s company advertising on GovernmentContractingOnline.com. I hate to sound so cynical, but c’mon, it’s obvious! Sick. The ad, not you, Lamar. What a hypocrite.